Beautiful Dangerous animal attacks news, Dangerous pets attacks, jellyfish, lions elephants big cats, crocodiles, snakes, Dangerous animal videos, animal pictures, animal facts, photos, endangered animal species, conservation animal rescue dangerous animals latest reviews from around the world. 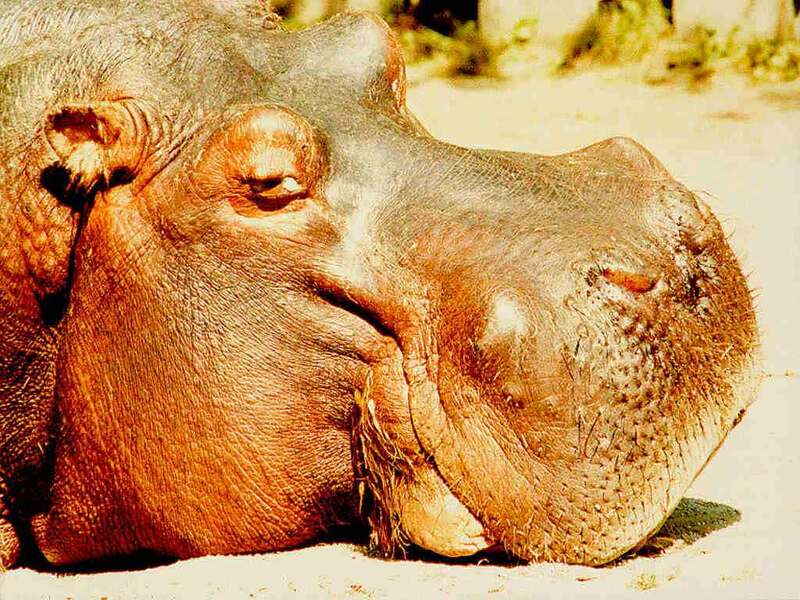 What are some of the greatest hippo facts that people can ever think of? Are hippopotamus clumsy? 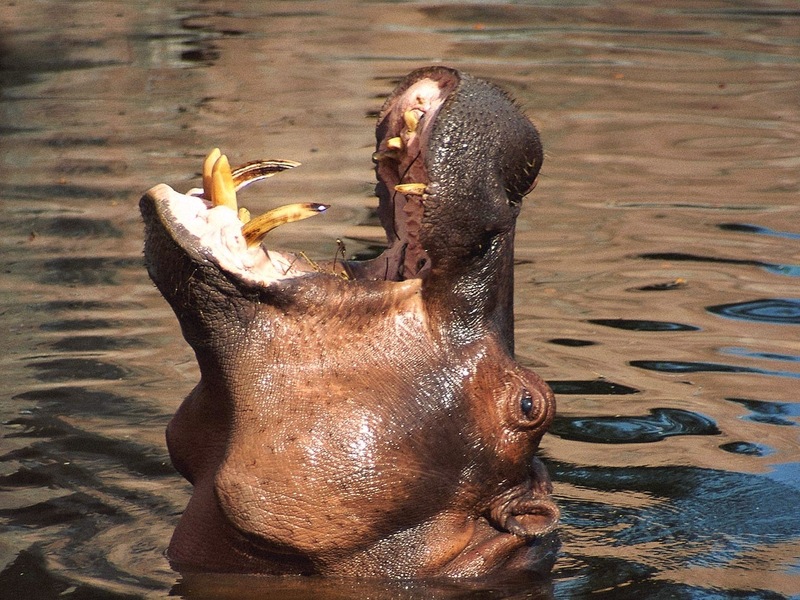 Can hippopotamus open and close their ears while they are in the water? 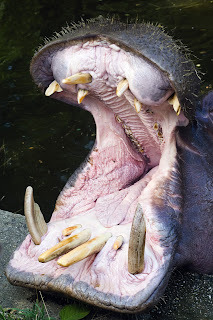 Why do hippos have wide mouths? I guess if there was to be a mouth opening competition in the world, the hippopotamus would not only get the world record for the biggest mouth opening performance and for all the ladies out there the animal with the best lips in the world. And for those who like their own space, there is no other animal which can really show and have the guts to mark its territory with its own feces and not even the king of the jungle can mark and match the hippo for marking its territory while its on the go. These beautiful dangerous animals of the African Savannah have made names in the history of many hunters, missionaries, traders and explorers who came to Africa to explore the beautiful flora and fauna of Africa during the hay days and by the time when the scramble for Africa was taking place. The Nile hippopotamus, Order: Artiodactyla, Family: Hippopotamidae, Genus and Species: Hippopotamus amphibius has managed to survive all the environmental conditions in the world. The hippopotamus is considered endangered and the plight of many of these river horses is in danger of being illegally poached as competition between man for his habitat and the hippopotamus for its feeding and breeding ground is diminishing day by day as the common man's need keep on rising with both natural calamities and unforeseen civil unrest in many of the hippopotamus habitat which puts the plight of these beautiful hippos even in danger. Hippopotamus are beautiful wild animals of Africa and which are found in many of the world animal zoo or hippopotamus zoos and to many of these cute animals they are also know as the "river horse”. Its a fact that hippopotamus are the third-largest living land animals. The beautiful African elephants holds the list as the biggest land mammal then followed by the great endangered white rhinos. One amazing fact about the hippopotamus is that the hippo is a rear land animal adapted for an amphibious life in many of the African Savannah habitat and with its bulky body it moves around in its natural habitat during night in many of the dangerous Nile rivers lakes and ponds and during the night it moves out to feed on the natural vegetation and sometimes comes into contact with agricultural farm produce and there the clash of the hippopotamus and the angry farmers whose crops are grazed to the ground just within a night. The hippopotamus is just as comfortable in the food chain as far as being a herbivore mammal and with an average life span in the wild of up to 40 years. 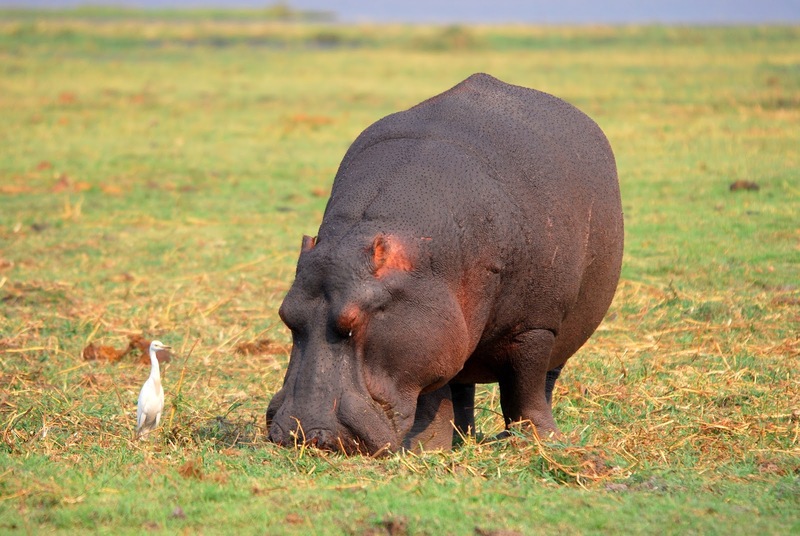 For all those who have seen hippopotamus in the wild, the hippopotamus are just very huge animals. as clumsy and as fat as they look, these beautiful creatures and especially the Nile hippopotamus can grow up to 15 feet long. That's as long as any small car in the world and as far as the hippo's weight is concerned, its a hippo fact that the males are heavier than females, weighing up to 8,000 pounds. Nile hippos stand from four and a half to five and a half feet tall and guess what, these top ten world's most dangerous hippopotamus weigh about 4000 kgs. attacking the hippopotamus on the back as part of a symbiotic relationship where by the oxpecket depends on the hippopotamus for food by picking ticks and other parasites from the hippopotamus or just having a ride with the hippopotamus, the giant hippo is always happy for having a bird which in the end makes it live longer. 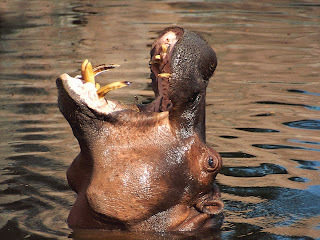 one amazing about hippopotamus is that its not just the birds which do the cleaning of the hippopotamus. 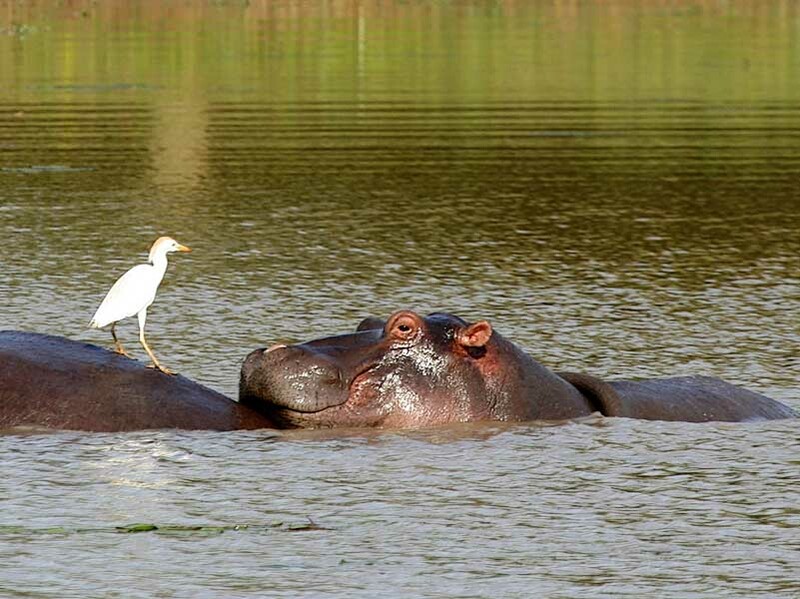 When the hippopotamus are swimming or just in the water resting, fish in the water take the chance to nimble whatever parasites and insects that might be stuck on the hippopotamus body. The fish clean the hippopotamus and this is just one of natures amazing wonders. 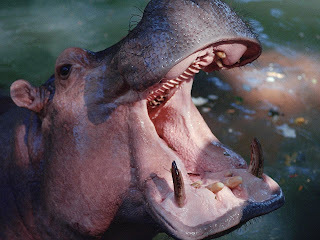 Guess what if the fish can clean the hippos mouth, these beautiful fishes in the water also take the time to clean the hippopotamus teeth as well. The hippos normally have some little time when they are being cleaned. They just open their mouth and there you go the cleaning of the mouth and any food particles that might just be there are swept clean and there you have it once again some of the greatest animal mysteries which the hippopotamus has to share. Other amazing dangerous animal pictures and hippopotamus videos made are about the amazing relationship between the Nile crocodile (Crocodylus niloticus): while they are in the same dangerous lakes and rivers of Africa. well there are times when some of the Nile crocodiles have been attacked by these massive hippopotamus but nature has its own ways of keeping these world's most dangerous animals to co exist together in harmony. I wonder why man has not been able to take such a good relationship. Guess what its the sheer animal instincts which we don't have but animals just make use of them any time and any where. For them, they have no rule of thumb but just being wild and that is what they are capable of being while they are in the wild. Why do we have hippopotamus attacks around the world? How does it sound when one hears that somebody has been attacked by a hippopotamus? 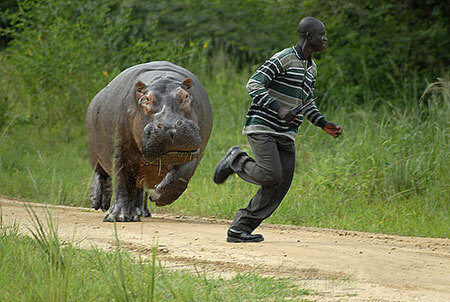 The picture of someone being attacked by a hippo just doesn't ring a bell. It's not even something to imagine. 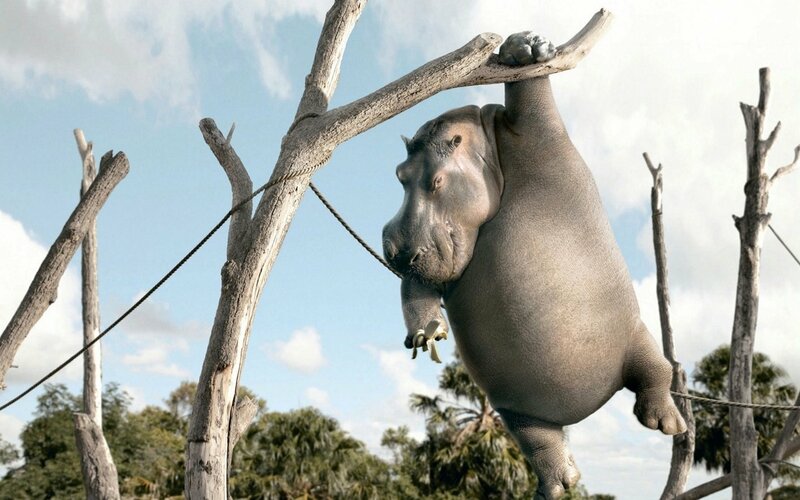 Being attacked by a hippo and chopped into two pieces is just one of the fatal scenario one would encounter. Well such hippo attacks cannot be possible unless you are the darering person and did not take any precautionary measures against hippos and hippopotamus attack information before venturing in the hippo's habitat. 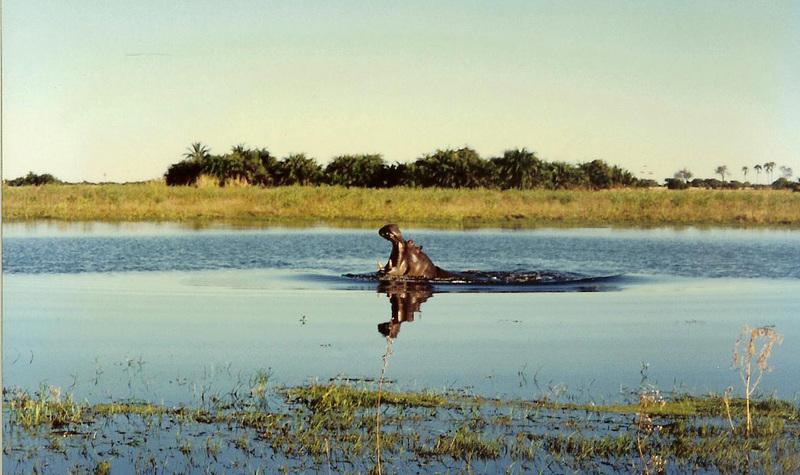 Is there something being done about hippos around the world? 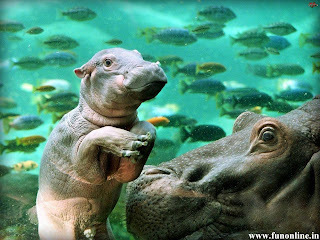 Many world zoos where hippos are kept are always visited by people who love to see these great river horses. The information they get about the hippopotamus is very important as they tend to take memories with them and as a result its the onset of the hippopotamus awareness that needs to be imparted in many of the animal lovers and some who wish to be animal or hippo enthusiasts as well. While a lot is still being done on the plight of the hippopotamus around the world, some of the hippo species around the world are still on the verge of extinction. The pygmy hippo which is only found in West Africa has seen many of its numbers dwindle due to the continuous illegal hippopotamus poaching and the luck of hippopotamus protection and conservation mechanism which is one of the biggest problems faced with hippopotamus and many of the endangered animals round the world. Its about time people realise that it takes a lot of helping hands and resources to protect hippos and all the animals that stand to benefit in the hippopotamus habitat as well so that something about the hippopotamus can be done in order to save these great river horses of Africa and of the worlds most important zoos as well. The beautiful hippopotamus population is declining as the number of hippopotamus attacks also keep on going down as many of the hippopotamus in the Africa continent are located in agricultural, mining and forests regions and many of the African lakes and rivers where natives depend on their land for agriculture while some come to the lakes and rivers of Africa to collect water, irrigate their land and also become victim of circumstances while travelling in these treacherous infested hippopotamus and crocodile great lakes, rivers and dangerous waters. 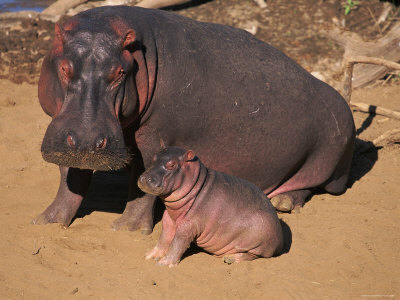 The natural home for hippopotamus is in Africa. 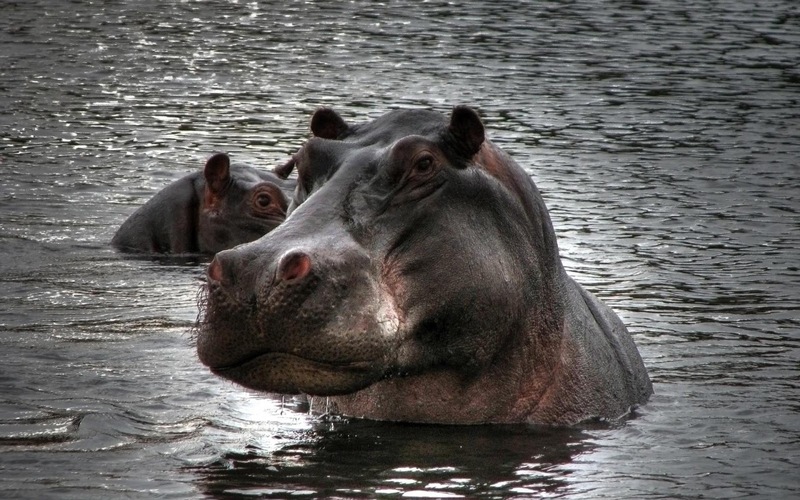 People visit Africa to see these powerful hippopotamus in their natural habitat and its amazing to note that the hippopotamus (Hippopotamus amphibius), or hippo,comes from the ancient Greek word which means "river horse". 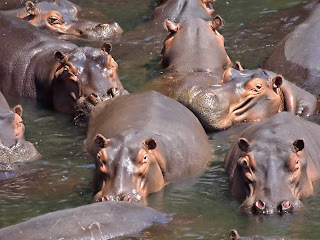 The home and habitat of the Hippopotamus of Africa are mostly found in sub-Saharan Africa and especially in East Africa in courtiers such as, Kenya Tanzania, Uganda, and countries south of the Sahara mostly Malawi, South Africa, Gabon, Lesotho, Namibia, Rwanda. One very rare animal species related to the hippopotamys the pygmy hippopotamus mostly found in the west Africa in many countries such as Côte d'Ivoire, Equatorial Guinea, Réunion, The Gambia, Ghana, Guinea, Guinea-Bissau, Liberia, Nigeria, and Niger where most of the animal attacks or hippopotamus attacks keep on making headlines about hippopotamus attacks. The amazing this is that all hippopotamus will graze in the same are and look for food miles away and way back to their resting ground. 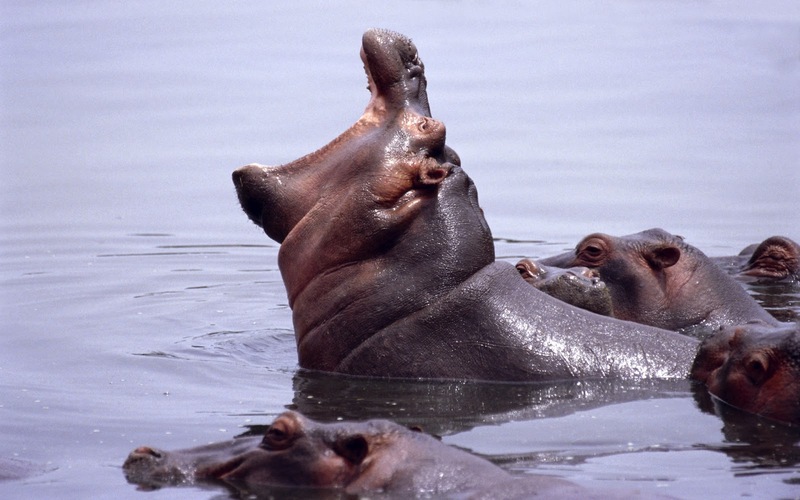 Some hippopotamus attacks making the news around the world. 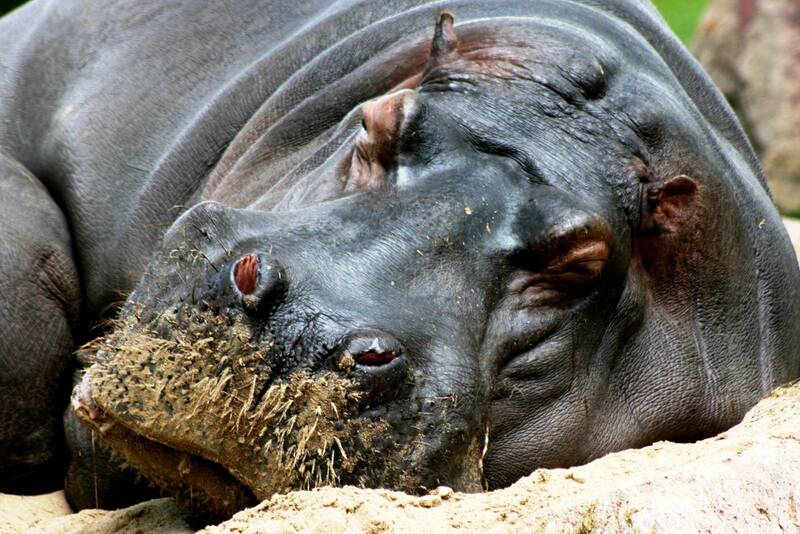 Four more bodies were recovered at Goye Beach, Siaya County, bringing the death toll following a hippo attack to six. The bodies were found Wednesday morning in Lake Victoria, while the other two had been retrieved the previous day. 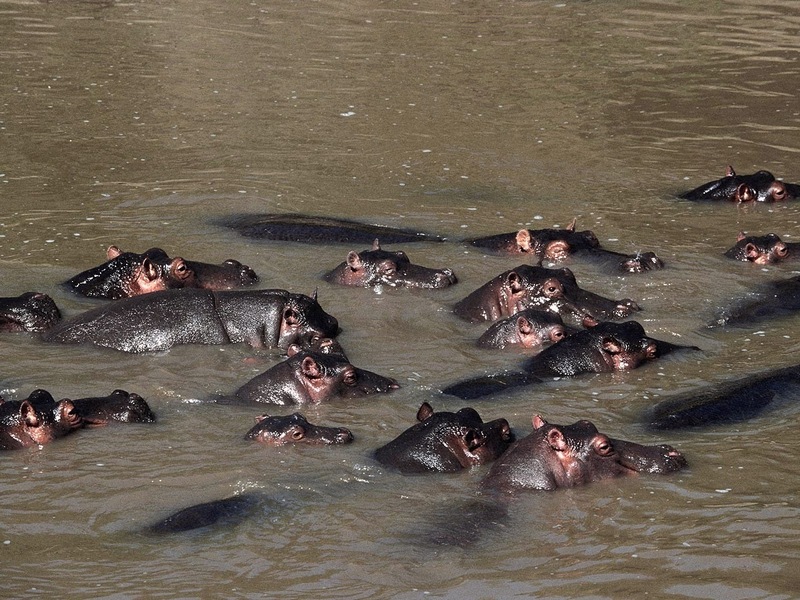 Four people survived the incident where a hippopotamus attacked 10 fishermen on a boat on Sunday night. The hippo broke the boat into two. Kinshasa - A hippopotamus killed a member of Democratic Republic of Congo government forces at Virunga National Park while he was fishing illegally, a local environmental NGO said Saturday. Bantu Lukamba of the IDPE non-governmental organisation told AFP that Private Sebagendi was killed on Thursday when he was fishing along with five other people on Lake Edward in spite of a fishing ban. "As he could not swim he was devoured by the hippo which had earlier overturned their boat," he said adding that the incident was the first of its kind in the park which covers an area of 790 000ha. Usually, "they (the military) shoot at the animals," he said. According to Unesco the park which borders Uganda comprises an outstanding diversity of habitats, ranging from swamps and steppes to the snowfields of Rwenzori at an altitude of over 5 000m, and from lava plains to savannahs on the slopes of volcanoes. Mountain gorillas are found in the park, some 20 000 hippopotamuses live in the rivers and birds from Siberia spend the winter there, the United Nations cultural organisation said on its website. IDPE said "at least 18 animals including seven elephants, four hippopotamuses and a lion were killed in the park between late August and early September". Durban - A man who lost a leg when a hippo savaged him in his garden has started the long road to recovery and is expected to leave hospital in two weeks. Anthony Swatton, a mechanic with Ezemvelo KZN Wildlife, was attacked on July 12 in his back yard in St Lucia on the KZN North Coast. His left leg was amputated halfway up his shin. Swatton’s sister, Carrie Cunningham, told The Witness from her home in Hilton that the family had received a lot of support. Her brother has been recuperating at Netcare The Bay Hospital in Richard’s Bay. In an interview last week, Swatton said he went outside when he heard his dog barking and encountered the hippo. He described how the animal threw him into the air, breaking three of his ribs. It also took a bite out of his left leg, cutting through flesh and bone. The attack ended only when Swatton punched the animal on its head. Swatton’s family has been raising funds to help his rehabilitation. Donna, believed to be the world's oldest hippo, has died at the age of 62 after living more than two decades beyond the massive mammal's usual life expectancy, zoo officials said. Donna had lived most of her life in the small town of Evansville, Indiana at the Mesker Park Zoo and Botanic Garden. "It is with great sadness for us to announce that Donna, the world's oldest living Nile hippopotamus in captivity, was humanly euthanised this morning due to her declining quality of life caused by her debilitating severe arthritis," Amos Morris, the zoo's director, said in a statement on Wednesday. Donna was born at what is now the Memphis Zoo in 1951 and arrived at Mesker Park on August 7, 1956. She had eight offspring with her mate Kley and had lived at the zoo longer than any of the current staff have worked there. 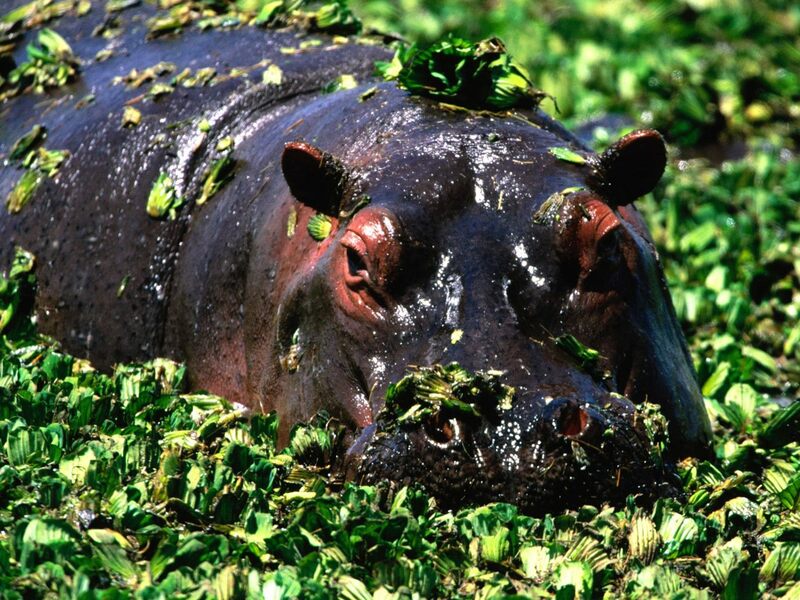 Hippos typically live no more than 40 years in the wild and about 50 years in captivity. Why do such dangerous Hippopotamus attacks take place? 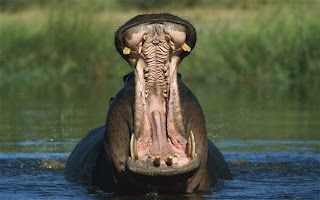 With death role of around 200, hippopotamus have been known to kill other animals and many people mostly farmers and nomads on dry land who move from one place to another in search of greener pastures and water thereby falling pray to this huge dangerous wild animal which is one of the biggest land animals. Is it people to blame for such dangerous animal attacks? Do these hippopotamus have a role in many of the animal attacks associated the natural habitat where the hippos are found? The natural vegetation found in water and on river beds in Africa where these dangerous water and land animal are found are bred can be a killing ground as these giant hippos with their aggressiveness can come out when people or other dangerous animals encroach into their territory or when they find themselves victims in places where the Hippos are foraging during their nocturnal rounds in any given locality. With all the information people have about hippopotamus among the local or the natives where these hippos are located, people always take it for granted that accidents do happen and are always careful not to come in contact with these hippos but sometimes you just find yourself in the midst of a hippo and you just have to run for your life otherwise you have to fight the hippo using your wits and skills. 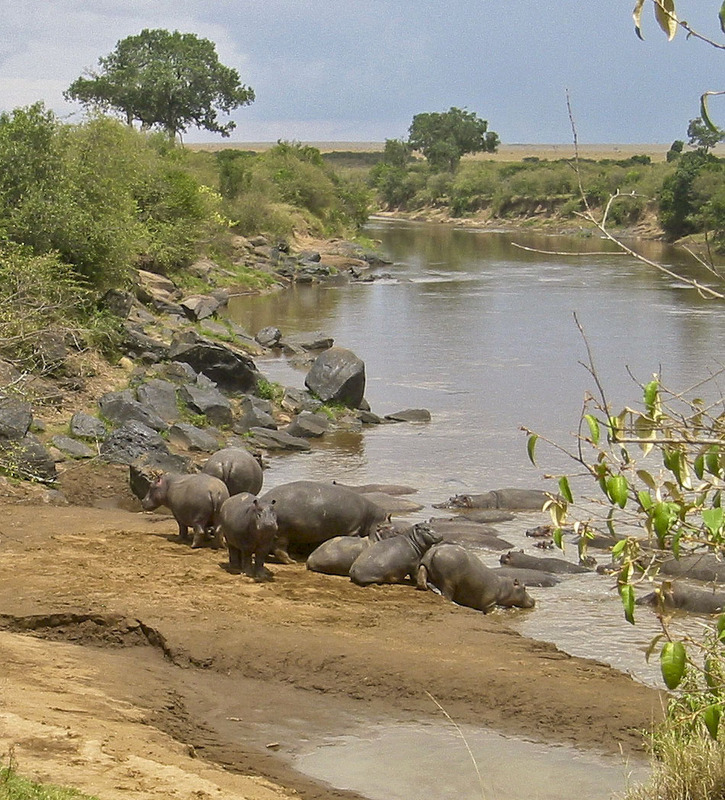 The African Nile hippopotamuses were found in abundant across the beautiful African continent. 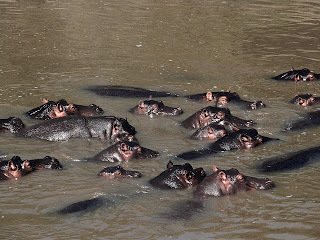 These great wild animals were mostly located where there was ample natural water for the hippopotamus to cool themselves off from the scorching heat of many of the African habitat and because of the plenty rich natural grass found in the African Savannah habitat for grazing. 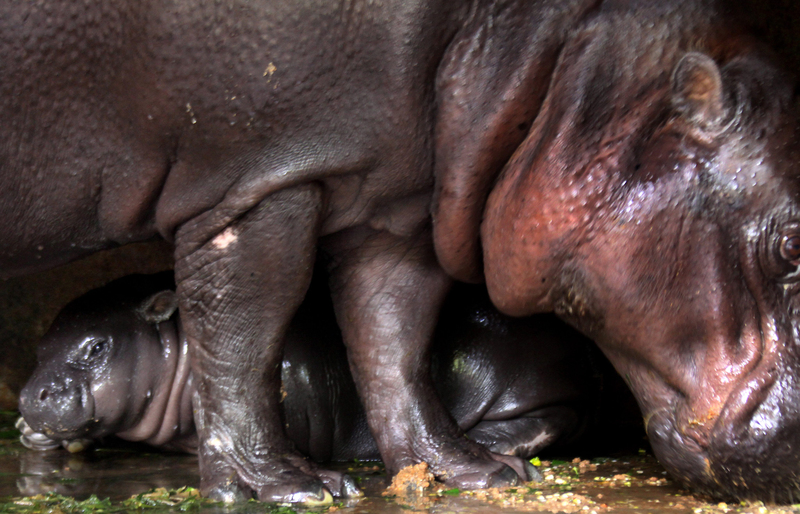 Do you really know the reason why the hippopotamus is becoming endangered? 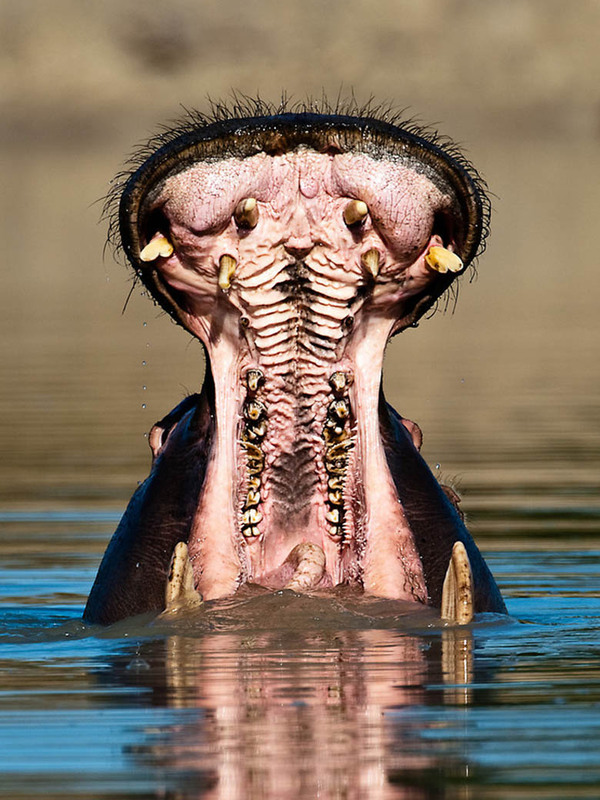 Hippopotamus hunting for its meat as a source of protein to the natives and as a very lucrative trade of the hippopotamus teeth in the world market. Whether is an intended animal attack or just the nature of habitat loss for the hippopotamus the combination of these reasons are some of the reason for the reduction of the hippopotamus populations. Have you ever wondered how would it feel to scuba dive with hippopotamus? In the deep sea, divers who venture deep in the ocean to study dangerous sharks are well aware of the dangers associated with sharks. What would it be if you were given a choice to study hippopotamus in thew water? My good guess is that's a big No, No! with this modern cutting edge technology people have managed to advance and getting to know the hippopotamus even better and its just the interest which people need to have as going for an animal safari waiting for hours for the hippopotamus to come out of the water is just not that fun for you. Zoological Gardens at Dehiwala outside Colombo, Sri Lanka, 18 April 2011. Hippopotamidae family with are native to Africa. At the same time you just wouldn't want to stay longer in the African jungle just to wait and see a hippopotamus coming out to graze at night. These are just some of the hippopotamus facts for those who would rather have a lion safari instead of the river horse. One amazing fact about the life of hippopotamus is that these four webbed toes dangerous sea horses spend up to 16 hours a day submerged in rivers and lakes under the company of other dangerous animals such as the African Nile crocodiles, the African elephant when it comes to take a swim to keep their massive bodies cool after grazing in the beautiful African Savannah grassland on a hot day. Many of the hippopotamus dangerous attacks take place in the rivers and lakes of Africa because hippopotamus are very good swimmers. 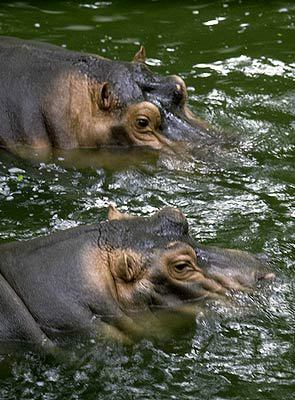 The Hippos can hold their breath underwater for about 5 minutes. These giant hippopotamus attack or capsize many boats and canoes when the stand or walk on the floor of many lakes or rivers. Sleeping hippopotamuses can rise to the water's surface to breathe. In the wild as the young male hippopotamus start to show dominance over the young female hippos, its always animal competition and animal instincts which dictates the events of the day and live along the hippopotamus world. The male hippopotamus are the ones which pose a threat to youngsters just like the male lion which comes to take over a lions pride and ends up killing all the baby lion cubs and sometimes you find these lions eating lion cubs just to wipe away the whole lion linage and to start a new one. As far as the hippopotamus are concerned, the female hippopotamuses always attack the male hippos that come close to the baby hippopotamus. The only way a hippopotamus can prevent such a deadly attack to take place is just by submission. If a female begins to attack the hippopotamus which might be problematic to its young baby, the male hippo usually lies down and acts submissively and peace is restored in the hippopotamus habitat once more. While foraging for food at night these dangerous hippopotamus travel 6 miles (10 kilometers) in a night, along single-file pathways, to consume some 80 pounds (35 kilograms) of grass. 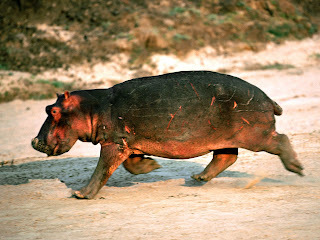 And if you are lucky enough to meet them on their habitat, running for your life is the only option otherwise you will end up being attacked by the hippopotamus despite the fact that hippos can match a human's speed for short distances. And when they are threatened on land these massive dangerous hippos may run for the water and take cover. These natural born killer animals though they are herbivorous, attacking a human being for them is just like another intruder in their natural habitat. For the continuation of the African hippopotamus species, the male hippopotamus always pose a threat to young or new born baby hippopotamus. 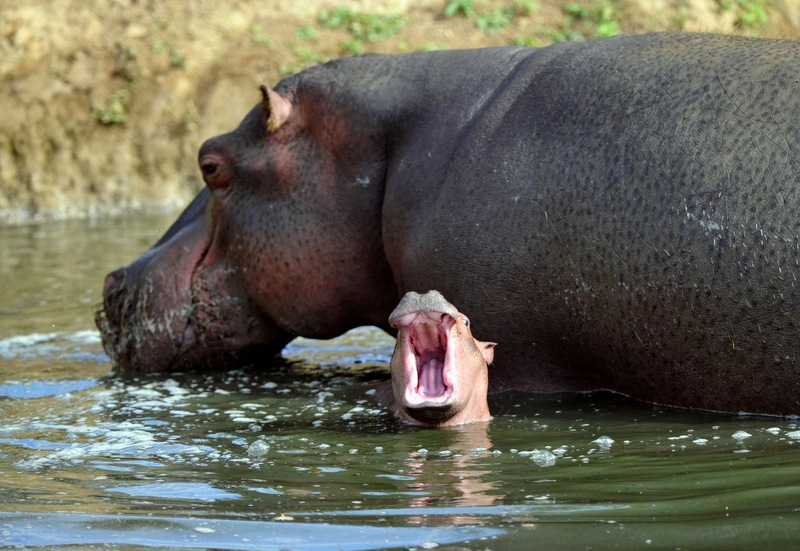 The female hippopotamus with its giant size mouth and teeth will always attack the male hippos that wander or swim too close to the baby hippo. The clash of the hippos will only end if the male hippo lies down and acts submissively to show that he means no harm to the hippo family. Are the hippopotamus going to be extinct, well these beautiful hippopotamus once thrived and were greatly feared when they roamed the whole of sub-Saharan Africa. 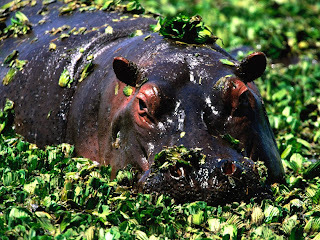 With the decline of enough and fresh water for the African hippopotamus for wallowing, cooling off and plenty of lash grass for grazing not many hippopotamus are remaining in the world. With little data or hippopotamus information in many countries where they are found, many of the hippopotamus attacks are also not recorded. Unless the endless hunting of these African hippopotamus end just because they have crosses the farmers line of income for his subsistence crops and for the hippos meat and teeth their habitat has dwindled only to remain in protected areas. Do hippopotamus really sweat blood? By the way is it bad if such thing for the hippopotamus to do. With all the animals in the wild having their own ways to blend with the environment and to be able to survive, its just one way of being the food web and part of the food chain in every natural habitat`. The hippopotamus delicate skin secretes a natural sunscreen substance just as some people have a habit of sweating lot but for the hippopotamus the secretion is red-colored. Is there a better to say that hippopotamus sweat blood? The secretion which the hippos give out is sometimes referred to as "blood sweat," but is neither blood nor sweat. Is there something to fear when people come into contact with the hippopotamus sweat? I guess there is no danger at all as its just part of any body or animal fluid that the hippopotamus produces. You find that the secretion is initially colorless and turns red-orange just after a few minutes and there after within no time becomes brown. What is the general composition of the hippopotamus sweat or the blood that hippopotamus sweat? As matter of fact, two distinct pigments somehow have been identified which gives the notion that hippopotamus sweat blood as in the secretions, one of then is the red (hipposudoric acid) and the other one, orange (norhipposudoric acid). If you think for humans salt and water make your sweat, for the hippopotamus, the two pigments are highly acidic compounds.One amazing fact about the notion t ht hippopotamus sweat blood is that all these pigments that consist of being the hippopotamus sweat naturally inhibit the growth of disease-causing bacteria as one of the natural wonders in the animal kingdom. the same time with all that in the African Savannah land the hippopotamus sweat is very useful as the light absorption of both pigments peaks in the ultraviolet range, creating a sunscreen effect. What natural way to protect oneself from such forces of nature. If only people could understand animals, many of the great discoveries and diseases would have vanished in this world. But lets not forget that every animal and human being is unique in their own way and hence the distinction of species and to some extent the differences in using our sixth sense. One amazing fact about the hippopotamus sweat is that whether its the African hippopotamus or the pygmy hippo found in many of the world zoos. 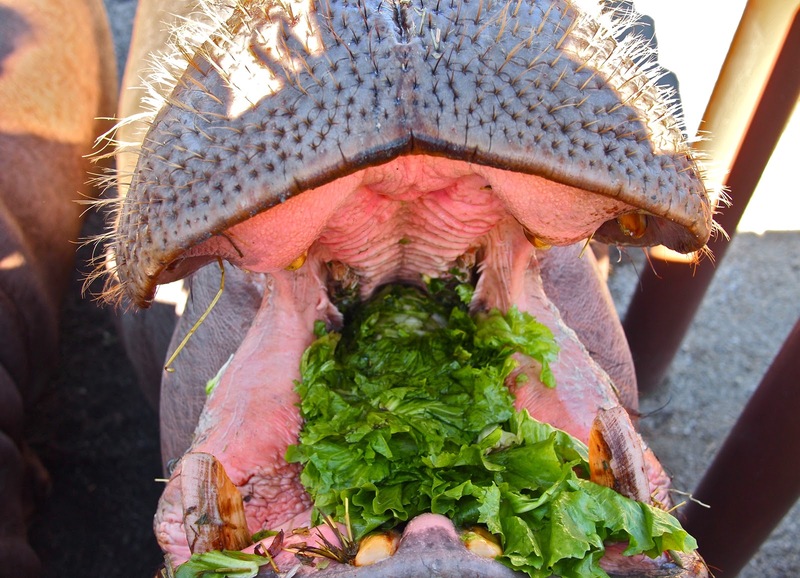 These hippopotamus, even those with different diets and fortified food as part of the special diet for the hippopotamus secrete the pigments. Its amazing to note that whether its an amazing fact that hippopotamus sweat blood or a myth which has been carried on from one generation to another, it does not appear that food is the source of the pigments. All wild animals have their own great stories and their parts in the African rich culture where wild animals are just part of every land inhabited by man. The Hippos in Africa and even in the ancient Egypt have been the subjects of various African folktales. As far as some of the special tribes of Africa and the hippopotamus as far as the African Bushmen are concerned, and the Bushmen ancient story of the hippopotamus is concerned when the Creator assigned each wild animal their place in nature, the hippopotamus wanted to live in the water and given the gigantic mouth of the hippopotamus, these beautiful hippos were refused to stay and live in the water due to the sheer faith that that the hippopotamus might eat all the fish. Since fate was not on their side and something had to be done about the hippos after begging and pleading, the hippos were finally allowed to live in the water on the conditions that they would eat grass instead of fish and would fling their dung so that it can be inspected for fish bones. The next time you see a hippopotamus out there doing his own things, just remember its just another folktale being put to practice and as the right of the hippopotamus as well. Another famous tribe of Africa as far as the Ndembele tribe is concerned, The hippopotamus tale is very unique in the way that the hippopotamus originally had long, beautiful amazing hair just like most of the other wild animals. You find that this beauty came to an end as it was set on fire by a jealous hare and had to jump into a nearby pool. 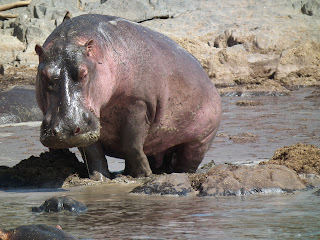 The hippo lost most of his hair and was too embarrassed to leave the water and that's why you see the hippopotamus only coming out to eat at night or when the sun has gone down. When did people start talking about saving the hippopotamus? Are there any good songs about hippopotamus? Well how about some good interesting movies which the whole family can enjoy about hippos? Its not just the beautiful celebrities who are the pioneers of saving most of the endangered species in the world or some of the philanthropist who have gained fame in the cause of saving some of the endangered animals and especially the endangered hippos of Africa. Very few people are aware of the famous Gayla Peevey. People all over the world have lived to show support over animals. It doesn't matter the kind of animal and the animal species and as far as hippopotamus are concerned, there is no special hippopotamus song which had an early hit in the chats way back in the early 1950 when the song "I Want a Hippopotamus for Christmas" paved the way to one of the greatest hippopotamus to be part of one of the greatest zoos in the world. Do you think such a song could have made a difference in our times? Well its all about education information and communication that people become aware about wild animals and the plight they are in and hence the need to do something about it. If Gayla Peevey was only ten years and sung this beautiful song "I Want a Hippopotamus for Christmas" is a Christmas novelty song written by John Rox (1902–1957) do people need to learn from history and use what ever means to get that message out about hippopotamus and many other animals in the wild as well? Its about time that people need to realize when there is a hippopotamus out fit such as a hippo T. Shirt, a hippo cap a hippo mug, a hippo rag or even a hippo game so long as you get the connection Gayla Peevey who was 10 years old at the time in 1953 made a difference. The song peaked at number 24 on Billboard magazine's pop chart in December 1953 and what was the result. A very happy community with a very beautiful song "I Want a Hippopotamus for Christmas" which lives for ever.